What gives a food its taste? Molecules, of course! You probably learned in school that there are four basic tastes: sweet, bitter, sour, and salty. 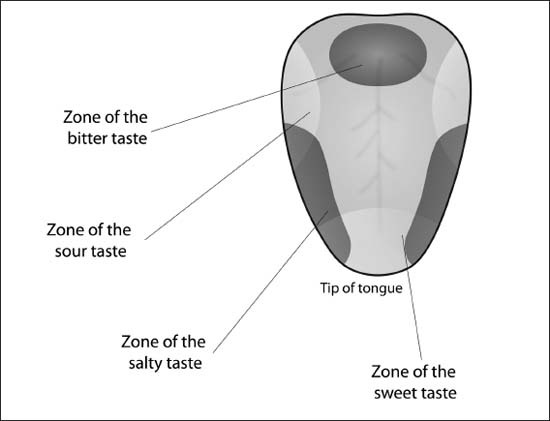 Your science textbook probably also had a diagram like the one on the following page, showing that your bitter tastebuds are located on the back of your tongue, and sweet is tasted on the tip. Wrong. Wrong. Wrong. Not only are there at least five basic tastes, but they’re basically spread out evenly across your tongue. The five basic tastes are the four you know from elementary school, and umami. If you grew up eating Western cuisine, umami tastes like MSG, or maybe you just think “Asian” food. There is debate as to whether there is a sixth basic taste bud that senses fat, or maybe another sensor for piquance (spiciness). But not even those five (or six, or seven) basic tastes fully account for all the sensations you get during eating. Wine is probably the best example (if you drink wine, of course). What makes wine taste “dry”? The “dry” taste certainly doesn’t fall into one of the five basic groups, but it is known to be related to the presence of tannins. So is there a tannin taste bud? No one knows yet. The old notion that different regions of your tongue detect different tastes has been shown to be false. Instead, taste buds all over the tongue’s surface can detect all the basic flavors of sweetness, sourness, saltiness, and bitterness.